It is no joke that a gelateria exists on every corner in Italy. Italians love their gelato and there is always room for one more shop. I am baffled and in awe at the same time that such an entity in excess thrives. My aunt in Rome explained, "Ingredients are cheap, the price of a cup or cone is cheap, and even in the Wintertime a gelateria can prosper." After tasting the gelato in Rome, I am a believer. Here are three gelaterias worthy of a visit in Rome. 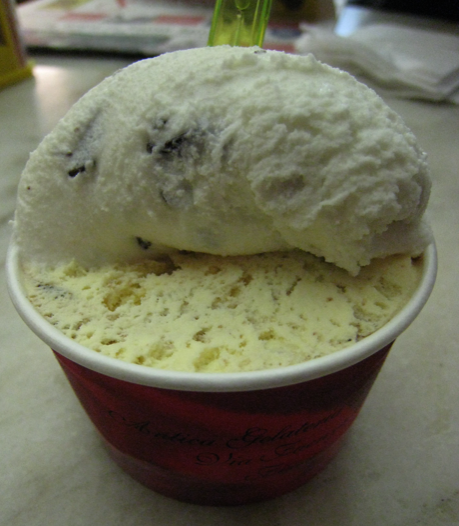 Il Gelato di San Crispino is a short walk from the Trevi Fountain but is a bit difficult to find. Sweet rewards will be waiting for you once you find it as Il Gelato di San Crispino is very famous in Rome. The Crema al Miele (honey) is the signature flavor. It is faintly sweet and softer than you can imagine. Service is friendly. If you are looking for a place to sit, it is recommended you take the gelato to go. The seating area in the back is roped off and used only during special events. Millenium is close to The Vatican but a little off the beaten path. It is in the residential area of the neighborhood Prati across the street from the church and Cipro metro station. There are many flavors to choose from at Millenium. Cachi (persimmon) stood out the most. Go for what's in season. Presentation is fun. Each cup comes with a baby gelato cone. Frigidarium is a small gelato stand. If you are ever in the area to shop or to have pizza next door at Da Baffeto, Frigidarium will be your savior from the crowds and long lines. This was my favorite gelato place in Rome with San Crispino being a close runner up. The difference is that the gelato at Frigidarium is much creamier and more fulfilling. It's definitely an indulgence. Banana was grey which means the gelato is not laced with dye. For something different, try the Spagnola. Translation is debatable whether it is black cherry or Amorino. Regardless the answer, it is a favorite amongst the locals. I imagined myself holding an ice cream cone filled with soft gelato, rich in flavor. I love ice cream and the thought of an endless supply of gelato in Italy was enough to convince me to buy plane tickets to Europe. In preparation for my trip, I ended up with a list of 23 gelaterias compiled from recommendations, travel sites, and travel blogs. My plan was to hit each and every one of them. In reality, I ended up trying only a fraction and not all of them were from the list. Here are the five gelaterias I visited in Florence. Grom is a chain with locations all over Italy and select locations in the USA. I had mixed feelings about going to Grom in Italy but like any other chain establishment you know what to expect, just as you know how Coldstone tastes like in every suburb. One of Grom's signature traits is that their gelato is stored in metal canisters. Expect long lines with tourists. It is right around the corner from the Duomo. Antica Gelateria Fiorentina. That's Franceso! Antica Gelateria Fiorentina was so good we ended up going twice, two days in a row. It is a favorite amongst the locals. The price of gelato here is one of the cheapest in the Florence. A street vendor told us about this secret gelateria. However, it wasn’t much of a secret at all. We had discovered it the night before. Francesco, the owner, was so nice and friendly. He runs the gelateria with his wife and partner. Antica Gelateria Fiorentina specializes in crepes, mousse, gelato, and sorbet. Try the biscottino and fragola. La Bottega del Gelato is an outpost for Stickhouse. This gelato on a stick is a nice departure and break from the traditional cup and cone. Like a popsicle but richer, the ingredients are all natural and very basic- milk, cream, fruits, etc. Choose your gelato and dip it in almonds, white chocolate, dark chocolate, coconut... What fun! Grab one and go over the Ponte Vecchio. Over 20 flavors of gelato! Mango - Go for the fruity flavors! Gelateria dei Neri is one of the more famous gelato shops in Florence. It is in the vicinity of Santa Croce and Uffizi. Gelateria dei Neri is a feast for the eyes. They have many beautiful pastries in the window. Try not to get distracted. The mango gelato is out of this world.